As you may already know, I am a cancer survivor. I've now lived 24 years beyond my cancer diagnosis. Finding out you have cancer, going through treatment, beating cancer and being blessed with a second chance to continue on with your life are things you never, ever forget. You also never forget the other people with cancer you meet along your journey. So during this month of breast cancer awareness, as I watched the Ford Warrior’s in Pink; ‘Bang the Drum: Living Out Loud in the Face of Breast Cancer’ documentary, my thoughts naturally turned to my beautiful friend Jade. I met Jade in the Fall of 1988 when I started attending a support group for young adults with cancer. She had breast cancer, just like two other women in the group, Katie and Benita. When we met she was near the end of her treatment and things were going well for her. The visible signs of her cancer faded once her treatment was over. Her jet black hair grew back, the color returned to her cheeks and she opted for breast reconstruction surgery. I'm pretty sure if we hadn't of had cancer at the same time, we probably would have never met. Jade was about ten years older than me, recently divorced and working in the fashion industry. I was a 22 year old college drop-out who was living at home. Despite our different backgrounds, we became friends. With the others, she welcomed me to the group. She shared with us how her cancer experience spurred her on to transform her life. She bloomed before our eyes as she went out and built that better life she wanted, surrounding herself with love, beauty, health and comfort. She inspired me to do the same. In my life, I have met a few people I wished I could be and Jade was absolutely one of those people. What drew me to Jade was her confidence, courage, empathy and encouragement. Putting her life together after cancer wasn't easy, but she did it with such aplomb. And when I hit a few bumps in the road as I was putting my life back together too, she reached out and helped me get through them. Unfortunately her breast cancer came back nine months later. I did everything I could to be there for her as she faced more rounds of treatment. Tragically, she lost her battle on December 6, 1990 at the age of 35. I was one of many mourner at her funeral who were all grief-stricken over the death of someone so young and so full of life and vitality who was taken away from us much too soon. I know she is just one of many fallen breast cancer warriors. She may have lost her battle, but she lives on in my heart forever. Today my grief has been replaced with hope, hope that her cancer experience has in some small way helped researchers and doctors improve the treatments and the care they provide to those battling breast cancer receive today. 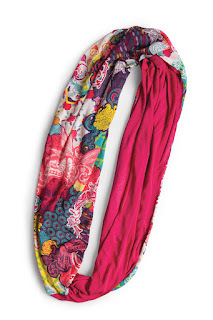 Jade was a fashionista, long before anyone had coined the term, and I think she would have loved this Circle of Hope scarf from the Ford Warriors in Pink collection which you can find here: http://www.warriorsinpink.ford.com/. I'm buying one to help fund the continuing fight against breast cancer and I'm wearing it as a tribute to my friend and breast cancer survivor Jade. This October, Ford Warriors in Pink® has launched its first ever produced documentary, “Bang the Drum: Living Out Loud in the Face of Breast Cancer.” The film honors 11 female and male breast cancer survivors who have demonstrated strength and courage in their battle with its “Models of Courage” program. While Halloween is just one day out of the year, the real truth is that tricks and treats happen to us all year long. Take health care for example. We keep consuming health care even though, every 7 days, the number of hospitalized patients killed by medical mistakes would fill 4 jumbo jets. Dr. Marty Makary says that if medical mistakes where a recognized cause of death, they would be ranked number 6, right after accidents and before Alzheimer's disease. Now that is some really scary stuff. While it is true that dead men, and dead patients, tell no tales, their families do, and rightfully so, through the media, lawsuits and formal grievance procedures. But what about the rest of us, fortunately spared an untimely death, but still receiving care that is erroneous, sub-standard or unneeded? According to ProPublica, an independent, non-profit investigative journalism newsroom, most of the patients affected by medical mistakes do not file formal reports about them and they think this is a problem for all of us. I found their article Why Patients Don’t Report Medical Errors to be an informative primer on this subject. Since one of the barriers to reporting errors is knowing who to contact to file a formal grievance, I recently put together a resources list for those living in the United States here. So I asked participants in this month's Patients for a Moment (PFAM) blog carnival to be brave and courageous. I wanted them to write about the ways that health care has scared them, injured them or let them down. I hope they inspire you to do the same, because I think to get better health care we all need to be empowered to discuss every aspect of it: the good, the bad and the ugly. Poor Iris! Some pretty scary things happen with her medical care when she was in her 20's, long before she was diagnosed with lupus. Seems her doctors and other health professionals should have given her more information when they obtained her consent to carve her up and stick a tube down her throat. Read Medical Horror Stories over at Sometimes, It is Lupus. For some of us, nothing causes as much dread and foreboding as anticipating "the talk" from our doctor about how we need to lose weight. Kathy from FibroDAZE advises caution though if you doctor suggests taking newly-approved Qsymia and Belviq to help you shed the pounds. These drugs have the potential to cause some pretty horrific side-effects, which has got Kathy thinking Obesity Has Gotta Be Healthier Than This. Witches are scary, with their evil spells and potions, like the one from the fairytale Snow White who said, "Take this apple, dearie. Go on. Have a bite." Duncan Cross knows what is even scarier. It's when a witch is disguised as a doctor and encourages you to take a drug that turns you into a...well, you'll have to go find out: Things I Blame on Prednisone. Maniacal doctors experimenting on patients, medical procedures conducted without anesthetic and bone-chilling screams; these things don't just happen in the movies, they can happen to you at your next doctor's visit. Shruti of Lifestyles of the Ill and (mostly) Blameless shares her true story about her encounter with "Dr. Frankenstein" in Tales from the Emergency Room Crypt: Spinal Tap. It sure sent shivers down my spine! Oh the creatures of Halloween--zombies, vampires, werewolves and witches--each doing something different yet equally frightening, like eating brains or drinking blood. Did you know there are over 60 different kinds of doctors practicing in our medical system? They all do something different too and sometimes you have very good reasons for needing more than one of them as Rachel points out in her post #NHBPM - How ridiculous! at Tales of Rachel. Let me be clear here: it's not just doctors making mistakes or ignoring patient feedback. In Sometimes The Truth Is Scarier Than Fiction: A First-Hand Account Of A Medical Mistake, Leslie tells the tale of a nursing error that landed her in the hospital for 3 days. Yikes! But she says that's not even the most troubling part of her story. Eek! See for yourself at Getting Closer to Myself. Restricting your T.V. time has to be one of every kids' nightmares, especially when that Halloween marathon of Twilight Zone episodes is about to begin. But can you believe this punishment got imposed on Rachael all because of a drug side-effect? Read this truth-is-stranger-than-fiction story and its sequel at Offbeat Follies: Mistakes of the Medicinal Kind and The Ghost of Douchebags Past. Halloween tricks--we all hate them. We hate health care trick too. Raise your hand if you, like Sharon of After Gadget, have even gone to a doctor's office that wasn't ADA compliant. What about a doctor who refused to treat you? You can all put your hands down now and proceed to Waspish Wednesday: Yes, Lyme DID Cause This. Who doesn't fear that Halloween staple, the haunted house? Unfortunately haunted houses aren't the only places where weird, shocking, annoying and unexplained things happen. See Selena's reflections on health care disappointments in Lessons I Learned as a Patient in the UCLA Health System here at Oh My Aches and Pains! Please join us again next time! Amanda at Crazy Miracle is hosting the next edition, so please visit her blog and look for her call for submissions at the beginning of November. We will also be looking for hosts for the carnival for next year, 2013, so please consider volunteering. Contact Leslie if you are interested. Want to learn more about PFAM? Check out the website and Facebook pages. I wrote this for a friend yesterday, but then thought maybe some of you needed to see this too. I'm happy to share, but can you do me a favor? Pull this out when I come to you all in the dumps and wanting to give up too. Okay? Life is hard. Change is hard. Just remember that it's hard for everyone, not just you. I know you feel like you can't keep doing this, but don't forget you have already proven that you can do hard things. In fact, you did so well last time that you now have something to hold on to, a start to your new beginning. I know you're stressed and upset because you face a new challenge, and darn it, you're still tired from the last one! But you have come so far, too far to quit now. Sure, it's easy to want to go back to the old ways of doing things, but deep down you know going back to the old ways really isn't an option anymore. Even if you're tempted, you know in your heart that it won't work and it won't be the same. I know you think it's not fair and too hard, but this is how life works for all of us. This is a lesson we all learn, some sooner, some later. Maybe it's taken you a while to figure this out and that's alright. Just please, don't give up now. You'll get the hang of this and everything will be O.K., eventually, I promise. So take a deep breath, dig deep my friend and build on your success by finding the strength and courage to keep moving forward. It is the only way to get where you want to go. Because I know if you put your heart and mind to it, you can and will go to amazingly healthy, happy and healing places. Can You, and Should You, Live Your Chronic Life Online? Over the weekend I was reading some articles on social media etiquette. This was after a couple of weird online encounters which got me thinking about the subject. So I searched to see what others were saying and found some good posts (see Related Articles below). "Social media may be great for sharing and keeping in touch with people but it's not a replacement for human contact." I understand that for healthy folks this rule might apply. But for those of us who are sick, can this, and should this, really apply to us? My first thought was, Yes, I would love to have regular, in-person contact with my friends who live in Los Angeles. This absolutely would be a wonderful and healthy thing for me to do! If I was able to do this, then social media would definitely be an interim way to connect with friends between in-person visits. Ah, but only if I was able to do this. The first obstacle for me to overcome is my abundance of disabling chronic illness symptoms. After 8 years, I am doing much better at managing these symptoms. But managing my symptoms is NOT the same as having control over them, and I still periodically get flare-ups and new, unexpected symptoms. That makes getting together with others something that happens infrequently; my in-person social life is only an option when I am feeling OK. If feeling well enough to see people is the first hurdle, then getting to the place where my friend are at is the second. "But there has to be other ways for you to get around, right?" Believe me, I've explored other transportation options in Los Angeles and it is a nightmare. The bus system in L.A. is overcrowded, slow, not very disabled-friendly and requires more walking than I am currently able to do. Plus it puts me at risk for heat-related illnesses when waiting at unsheltered bus stops or riding in a crowded bus. Paratransit disenrolled me from the program when I told them I had a scooter. In hindsight, that was a mistake on my part, because a travel scooter is really just the wimpy cousin of the full-size scooter, which is what I would really need to travel around by bus. I could have appealed and gone back that Summer to re-qualify, but declined since their evaluation center in East Los Angeles is a sweltering hot warehouse space. Why? Because it doesn't have any air-conditioning! Other options are taxi cabs and private car services, but they are just too expensive--especially since during the L.A. rush hour it can take an hour just to go just 5 miles. Seriously. Wow, let's face it: when you are a sick chick, "getting together with friends" takes on whole new meaning. It probably doesn't help that I live in Los Angeles either, fondly referred to as the "Car Capital of the World." That said, I still hope that one day I am able to recover enough so that my health is no longer an obstacle to social interaction. When chronic illness really limits that in-person option, isn't it nice to know there is at least one place to turn to for social support? I get it that connecting in social media is not the same as connecting in-person. But those outside our chronic illness community fail to recognize this as a concern worthy of attention and funding. After all, there are senior centers for the elderly, a place where they can go to socialize and recreate, which provide transportation so they can get there. Why isn't there a real-world place for adults with chronic illness to meet, socialize and come together? Online is better than nothing! I know if I didn't have the option of connecting with others via the Internet, I would definitely feel much more alone, lonely and unsupported. It fills a pretty important need for me, one that isn't really being met anywhere else. But enough about me. What do you think about this topic? Leave me a comment and let me know. As I discussed on Wednesday in my post Lessons Learned as a Patient in the UCLA Health System, sometimes you just need to file a complaint or grievance when things don't go the way they ought to when it comes to your healthcare. Since I'm going through this process now myself, I decided to put together a resource list to share with you here on my blog. I hope my research on this topic will make starting the process a little easier for you. Plus I was pleasantly surprised when I discovered that many of these agencies are set up to take complaints online, which saves you the hassle of printing and preparing forms and heading to the post office to get them in the mail. Most hospitals and healthcare facilities have in-house patient services departments that may be able to help you. Start by asking a member of your healthcare team about who is available to assist you, like your nurse, social worker or the receptionist. You can also call the hospital operator and ask for the name and number of the department that handles patient complaints. Call your health insurance company. They may have a nurse case management program that can advocate on your behalf. Their nurses will talk with you, contact your medical providers and working with you to manage your health care. This may be a free benefit to you depending on your health plan. You can ask to file a complaint against any network or preferred hospital or facility and your insurance company's provider relations department will investigate. Just know that they may not inform you of the results of their investigation. The Joint Commission, formerly the Joint Commission on Accreditation of Healthcare Organizations (JCAHO), is a non-profit organization that accredits hospitals and health institutions nationwide. Their Office of Quality Monitoring will review complaints filed against accredited institutions. Contact your state's Department of Health. This is the agency in your state that is either responsible for, or can connect you to, the division that licenses health care facilities. You can browse a complete list of each states' Department of Health here courtesy of the Centers for Disease Control website. In addition, your state may have a Health Care Association or Society that might want to hear about your concerns. While not present in every state, you can see a list for some of the organizations here courtesy of the Joint Commission website. They may have a nurse case management program that can advocate on your behalf. Their nurses will talk with you, contact your doctor and work with you both to manage your health care. This may be a free benefit to you depending on your health plan. You can ask to file a complaint against any network or preferred physician (or other health care providers.) Their provider relations department will investigate your complaint. Just know that they may not inform you of the results of their investigation. Contact your state's Medical Society or Association. These are membership societies so you'll first want to verify that your doctor is a member. Then check to see if they are set up to receive complaints directly or if they provide referrals to the organizations in your state who are. Find a complete list of medical societies here courtesy of the American Medical Association. Your doctor needs to be licensed to practice medicine and your state's Medical Licensing Board is the entity that handles consumer complaints about doctors. Look for the complete list here courtesy of the American Medical Association. NOTE: Your state may also have licensing boards for other allied health professionals, like chiropractors pharmacists, psychologists, social workers and physical and occupational therapists. Nurses also need to be licensed to practice nursing, so if your complaint is about a nurse practitioner, registered nurse, licensed practical nurse or certified nursing assistant, contact the State Nursing Board. You can view a complete list here courtesy of the National Council of State Boards of Nursing. Health plans are required by law to have a process to receive and respond to member complaints and grievances. So don't hesitate to call your health insurance plan, tell them you are dissatisfied with their services, determination of benefits or the health care treatment received through their plan and want to file a complaint or grievance. You can also refer to your member handbook or your health plan's website to learn how to use their grievance process. If you are covered under an employer-sponsored health plan, consider talking to your Human Resources Department or contacting the U.S. Department of Labor’s Employee Benefits Advisors. To contact your state's Department of Insurance, which regulates health insurance, head to the USA.gov website, click on your state and browse for the category State Insurance Regulators. For complaints about your Medicare supplemental health plan or prescription drug plan, go here to the Medicare website to learn more about filing a complaint. For complaints about Medicare, you can either speak with your State Health Insurance Program (SHIP) or the Medicare Beneficiary Ombudsman. For information about filing a complaint about your state Medicaid program, contact your local County Office of Public Assistance. Here is a complete list by state of Consumer Complaint Coordinators at the Food and Drug Administration (FDA) that you can call directly to report drug adverse reactions and other issues with FDA-regulated products. This is not a complete list and I welcome your input in revising and expanding this resource. In addition, I'd like to hear about your experiences in contacting any of the entities mentioned above, both good and bad. So please feel free to add information and your input by submitting a comment below. It's been over six weeks since the end of my Hepatitis C treatment and I've spent some time reflecting on my recent experience as a patient in the UCLA Health System. Today I'm sharing with you some of the lessons I learned over the last seven months. I hope some of these observations might be useful to you when you find your health care doesn't meet your expectations. As a person living with multiple chronic illnesses, you will often be frustrated and unhappy with how your physicians, hospital and/or health plan fail to provide you with the appropriate, cost-effective and person-centered medical care that you both need and deserve. I believe how my Hepatitis C treatment unfolded is yet another example of how the health care system is not organized enough to treat me, a patient with multiple chronic illness. Second, can I be honest with you and acknowledge that there are times when I am so beaten down and worn out from my health problems and my medical treatments that I just can't be my best advocate? Because this is exactly what happened to me! Can I also say that I am so frustrated when I find myself in this position way more often than I would like, just because I am a sick chick? I loathe putting my fate in the hands of others, especially when I have been let down more times than I care to count. But once I got past the feelings of anger and vulnerability, I knew I just had to bite the bullet and ask for help. I thought I had a good doctor-patient relationship with my hepatologist, a belief was based on the handful of 15 minutes appointment I had with him over the past 4 and 1/2 years. I wasn't expecting treatment to be easy, but I thought my doctor would be there for me. So image my surprise when, on two different occasions during my treatment, I realized I needed someone to help me resolve emerging conflicts between myself, my doctor and his hepatology treatment team. As I admitted above, during treatment I was too overwhelmed by a boatload of side-effects to be able to figure out and resolve these new communication problems by myself. The only thing I knew with absolute certainty was that my needs as a patient were not being met and I was afraid my treatment success would be jeopardized if I couldn't get things straightened out. "The Patient Liaisons of the UCLA Health System...assist patients and their family members with various concerns that relate to their overall experience at UCLA. Such issues may include, but are not limited to, quality of care, staff interactions, access to care and general assistance and information." Unfortunately I didn't receive the assistance I needed from Patient Affairs. So on July 24th, during a telephone conversation with the manager of the department, I ask to file a formal grievance. "When you or a family member contacts the patient affairs office, the chair of the clinical team responsible for that unit reviews your records. The hospital will then provide a written response to you or schedule a conference." I was told that a formal grievance could take up to 30 days. It's been 71 days now and I still haven't gotten a response from UCLA. When you are chronically ill, your health dictates that you need to pick and chose your battles. But sometimes taking a stand is critical to winning the health care reform war. So I decided last week it was time to pursue official grievance procedures, because I want to be an agent for positive health care change and an advocate from persons living with chronic illness, especially those with Hepatitis C infection. As the patients using the health care system the most, I think it is our responsibility to thoughtfully bring our most pressing concerns to the attention of entities like health care licensing and accrediting bodies. Because if we fail to speak up and share our concerns, we squander opportunities for the health care system to learn from mistakes, identify gaps in service and correct problems. While this rarely will make things better for us in the short term, I truly believe it will make things better for all of us in the long run. We need to keep our eyes on the prize. We all want a health care system that knows how to competently and compassionately treat persons living with chronic illness. To get there, we need to make our grievances known to the member of the health care system that have the power to recommend and implement changes. I'll be back Friday with a resource list of organizations in the United States that you can contact when you need to file a grievance. We all make mistakes...including your doctor. Since those of us with chronic illness use the health care system the most, I'm sure you all have a story (or two) to tell about the misteps, mishaps and misadventures that have happened to you in the course of getting medical care. You"ll have until the 12th of October 2012 at 11:59 PM Pacific Time to get your story to me. You can find more information about Patients for a Moment here. Invite your friends to join us too. I'm dying to read your submissions!